Salsa is a Mexican sauce made from tomatoes or tomatillos, peppers and cilantro. Other ingredients in salsa are onions, garlic and even corn or black beans. Salsa can be fresh or cooked, is a healthy addition to your diet as it is full of vegetables and herbs. The most popular way to enjoy salsa is with chips; however, tortilla chips fried in oil are not a good idea when you are on a diet. If you choose healthier chips, you can indulge in this treat and not worry about ruining your diet. Purchase baked tortilla chips or make your own. Using corn or flour tortillas, a light brushing of oil or spritz of cooking spray and a bit of salt, you can bake tortilla chips in your own oven and enjoy them while they are still warm. If sodium reduction is a part of your diet plan, use only a small amount of salt or even eliminate the salt from your homemade chips. Another way to enjoy salsa while on a diet is by dipping vegetables into it. Green peppers, celery and summer squash all make tasty vehicles for getting salsa into your diet. By choosing vegetables over chips, you greatly increase the amount of nutrients you take in and reduce the amount of fat. Even baked chips will contain some fat. 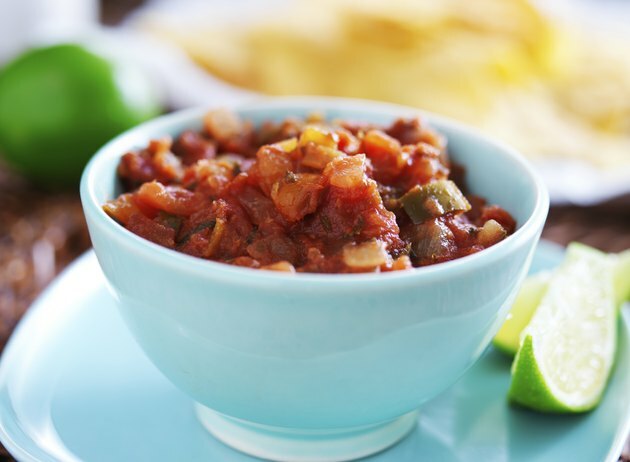 Vegetables are fat free, which makes them a guilt-free choice for salsa consumption. The very definition of salsa is sauce; therefore, consider how you can use it as a condiment to add to your dishes. Salsa can be a delicious complement to your egg dishes. It can also be a healthier topping for a baked potato. Salsa strewn over baked fries, on top of a salad, on a sandwich or on top of a burger will add flavor without adding fat or many calories. You can also mix salsa with other condiments to increase their flavor and nutritional value; however, be careful to consider the calories and fat in the condiments you are adding the salsa to when determining if it is a healthy choice for your diet. Salsa can be a great shortcut to making healthy, delectable dishes. You can also add it to soups and stews, use it as a sauce for poultry and fish or incorporate it into healthy casserole dishes. Because of its bold flavor, salsa can replace fattier additions to recipes, such as butter or oil to reduce calories and fat in the dish. Salsa is also a great way to flavor no-sodium recipes so you do not miss the added salt. Just choose or make a salsa without sodium in it. Making your own salsa gives you full control of your ingredients. For example, prepared salsas are often overloaded with sodium, which you can omit if you make it at home. Use chopped, fresh tomatoes as your base and build your salsa from there. You can add corn, black beans, garlic, chives, onions, lemon or lime juice, cayenne pepper, green pepper and even fruit. You can cook your salsa or leave it fresh. AllRecipes.com explains that cooking your salsa ingredients gives it a sweeter, roasted flavor. Your imagination is the limit when creating your own salsa. Are Nachos Good for a Diet?